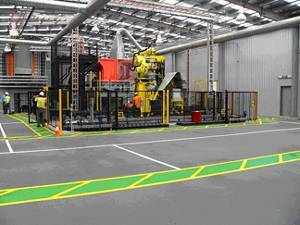 Australis Engineering, partner company with Australis Automation, recently completed an IBC and Drum conveying and filling system for Orica Australia worth over $2.5million. Orica Australia’s Botany site currently stores 50,000 drums of HCB waste which is to be repackaged into new drums and IBC’s suitable for transport. The project called for the complete design and manufacture of the system and Australis was contracted to both design the concept and specification of the entire production line, and then to complete the manufacture and installation of the system. Overall the system consisted of approximately 60 drum, IBC and pallet conveyors with transfer and reorientation devices, a drum decanting system, 200 and 100 litre drum palletiser, pallet stacker and de-stacker, pallet conveyor, automatic wash systems and an elevating conveyor unit for feeding pallets and drums into a shredder. 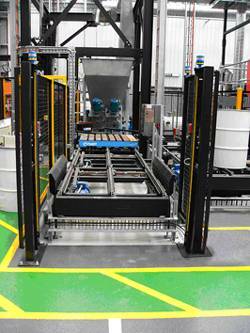 Working closely with key suppliers, additional equipment such as weighers, labellers and a shrink wrapper were also supplied and installed. The entire line was designed, manufactured and installed in approximately 12 months from initial conception to commissioning. Australis Director, Phillip Gustafson, said on the project: “This was a project where we showed that responding quickly to the initial enquiry and giving Orica the service they needed set us apart from other suppliers. We committed our technical staff to deliver the solutions needed, not a ‘one-size-fits-all’ compromise”. Advanced CAD modeling was used to design each item and modern manufacturing techniques such as laser profiling were used to ensure accuracy, quality and uniformity across all of the equipment supplied. To cope with the harsh environment, special powder coating was sourced and applied to all equipment. From here, final assembly and testing occurred to ensure quality and reliability before transporting to the Orica site, where key Australis technicians installed and commissioned the equipment. The entire project was performed on a continuous manufacture-install cycle, with teams of technicians working both on site at Orica, as well as in Australis’ own production shop. This was the real success of the project. 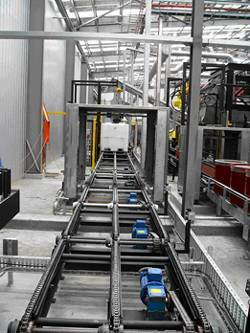 By designing the system from the ground up, manufacturing the systems and having direct control over the installation, Australis knew that the product, the conveyors and materials handling equipment would match each other and ultimately work.